Your Website Go To Girl™! Think of me as the web/marketing tech in your pocket! You’ve got tech questions? I’ve got the answers. I’ve created these credit packages because many times you may just need a few tweaks or modifications done to the site after it is created. Essentially, service credits purchased work like cell phone minutes. Blocks of time are pre purchased and are good for one year after purchased. 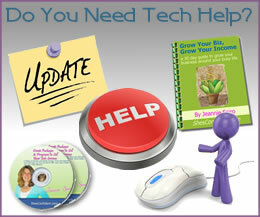 They can be used for anything that you need help with regarding your website and marketing. Contact me with your project details and I’ll get back to you with an estimate and a time when it will be completed. Once the job is done, I’ll send you detailed invoice that will be billed against the credit in your account. Projects billed against the credits are billed in 15 min. increments so you won’t get over billed for the work provided.